Change is something that’s forced upon us, whether we like it or not. If we can implement change ahead of forced change it would have to be better for industry as a whole. I am interested in the Climate Champion program because I like to see what other people are doing and hopefully I can pass that on, or try and encourage others to do what appears to be best for production and viability of the rural area. In 2001, my wife Donna and I bought Bunuro and worked there on weekends until I stopped managing 5 other properties, 4 years later. It was half boundary-fenced, and we had 5 main paddocks at the time. But we’ve since completely boundary-fenced it. Most of our divisional fencing is single-wire electric fencing. 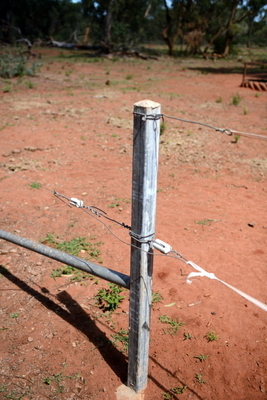 It works and it’s a lot cheaper, enabling us to do a lot more fencing than had we gone with three-wire fencing. We can also space the posts out to about 40 metres (instead of 15–20 metres), so there’s a cost saving there too. The 14 paddocks free of heart-leaf [a poisonous native shrub] average about 2000 acres (809 hectares) each, and the heart-leaf country is subdivided into another 8–10 paddocks about 4000 acres (1618 hectares) each. I think my family background may have encouraged me to look a bit further in my grazing management. My great-great-grandfather overlanded sheep [droving] from the Darling Downs to Mt Surprise in the 1860s. I grew up at Meadowbank, south of Mount Garnet, which was part of Gunnawarra, a property my great-grandfather bought in 1904. My mother was probably instrumental to a lot of new practices during the 1960s, such as having all the breeders on Meadowbank in a computer in Brisbane with CSIRO (correlating fertility rates) and practicing controlled mating. My grandfather farmed until the late 1970s at Meadowbank, which my father continued managing until 1989. I worked at the Valley of Lagoons until 1993, managed a property north of Hughenden until 1997, then we moved to Prairie. The breed of cattle we have is a Brahman cross base, and we’ve run Angus cross bulls: ‘composite bulls’, we like to call them. 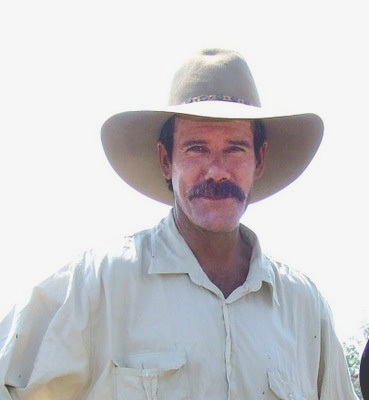 My grandfather was instrumental in the foundation of the Droughtmaster herd in the late 1950s/early 1960s, then we shifted towards Brahman bulls, and started using Angus composite bulls in the late 1990s. The stock are still about three-eighths to five-eighths Brahman content now. Brahman cattle are nice to look at and they’re very easy to handle, but they’re not the best for economics and fertility. We are always conscious of the heat when selecting our bulls. 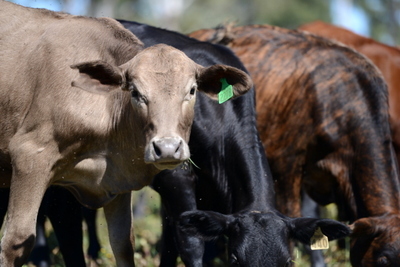 The pure Angus aren’t suited for this area for heat and nutrition, so half-Angus content lets them handle the climatic conditions in this area. As long as they’re smooth-coated, they seem to handle the heat and frost quite well. Records show we’re on about an 18–20 inch rainfall (457–508 mm). But I think we’ve had double that in some years and less than half in others. We can get as low as –7°C in winter quite often, and frosts and extreme heat. We are always conscious of the heat when selecting our bulls. That’s a normal trend in this part of the world. There aren’t too many situations, climatically, that haven’t occurred in human memory in this area, whether it be drought or flood. I know in other parts of the country it’s certainly not that way. I was possibly a sceptic to climate change, man-made or otherwise, but having been to Western Australia it certainly seems like it’s definitely an issue. In our situation we haven’t witnessed obvious declines in rainfall, but when you see consistently declining rainfall [in WA], it makes you aware you should be prepared for the same sort of thing. 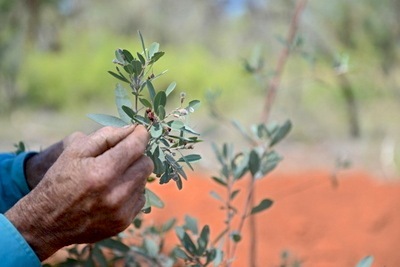 We have 30,000 acres (12,140 hectares over 14 paddocks) that are free of heart-leaf, which is a poisonous native shrub that will kill cattle. Native heart-leaf flourishes easily, especially after winter rain. Heart-leaf poison is the same poison that’s in the chemical ‘1080’ (sodium fluoroacetate). We have 40,000 acres with heart-leaf (16,187 hectares over 8–10 paddocks), which we can successfully graze at certain times of the year with paddocks in a rotation. In a good season, our clean country is adequate to carry the cattle. With winter rain we have 6 weeks before the toxins increase in the heart-leaf, then we’re forced to lock cattle out of the heart-leaf paddocks. We can use the paddocks with heart-leaf in the wet season of dry years, which normally we’re not game to. That takes the pressure off the ‘clean’ paddocks and we can extend their spell period. Using more of our country in those drier years leads us to better nutrition. 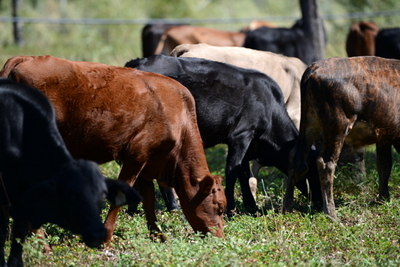 It’s the rest period that is the main driver behind the success of rotational grazing. A lot of people do rotate but with not enough focus on the rest period, and I think that’s the secret: the rest period. All of our paddocks get in excess of 320–330 days rest a year. Those wetter seasons are where we run into trouble. While most people are quite happy to have the wetter season, we’ve had our cattle in the clean country through most of the wet. We’re in a very unique situation with this type of grazing. No one’s ever done what we’re trying to do in a controlled manner, that I’m aware of. And the cattle industry’s so close to the wire that you can’t afford to have unnecessary losses. Historically, the grazing rate in this area was probably about one beast to 40–50 acres. We’re down to, on average in our clean country, one beast to 25–30 acres. We get down to one beast to 8–10 acres in a couple of really good paddocks. Economically it’s not a proposition to clear the heart-leaf. After 3 chemical treatments of land infested with heart-leaf, the cost often exceeds the value of simular land naturally free of heart-leaf and there will be ongoing treatment required. There is evidence of a property that has 100 years of grubbing [digging out] every bush and it’s still there, although very little. David’s wife Donna says: I use a grazing chart I created in Excel to calculate stock days per hectare (SDH), to record paddock yields and as a tool to calculate stock movements between paddocks. It includes paddock names and sizes. We look at the year before, for each paddock and the season. Not many people do so much fencing or keep records like this. But it helps to show how many cattle we can have here because this is very delicate country. We also have rainfall records. Our benchmark for our paddocks is about 6.8 SDH per 100 mm of rainfall. We know when we’re understocked or above our carrying-capacity benchmark. For instance, at the moment [May 2013] we have 2 mobs in the heart-leaf country: 400 in one paddock, and 900 in another paddock. So the ones in the 900 paddock are only there for 3 days, whereas the other mob are in there for a week, and you’re still taking out the same SDHs. We’ve got 90 kilometres of poly pipe with 50-odd waters. Water is the critical element of rotational grazing. 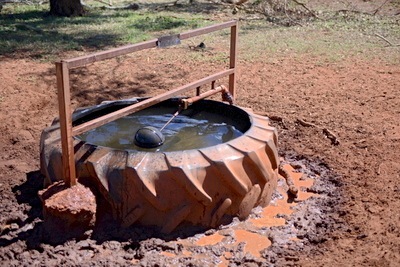 Our water troughs are made out of tractor tyres because we have so much infrastructure and so many troughs (about 100). 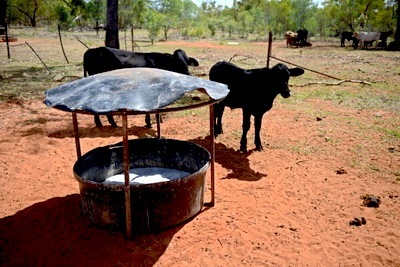 These really reduce our costs: a cement trough of similar size is about $600. I like to have a trough in every paddock in case there are cattle left behind. The tractor tyres you can pick up for nothing, it’s about $100 to cement the base, then there is the float and frame over the top to stop cattle walking through it. They’re quite long lasting. The earliest ones we did are 13 years old and there’s no sign of effect from the sun or cattle using them, so I expect they’ll be good for at least 20 years. We also make lick troughs out of tractor tyres and place them over a stump, cut a tree off at about 1.4 metres, throw the tyre over and cement the little bit around the tree. Then there’s a 1.6 metre x 1 inch RHS ring [rolled hollow section/square box tube] that’s intersected with two 40 mm RHS bearers that are slotted into the top of the stump, and there’s iron screwed on to that: that’s the roof for the lick troughs. We aim for calving before January. There is more than likely a 60% or higher percent chance of her having nutritious, green feed, and it’s easier to re-conceive. But the January/February/March calves don’t get weaned until late/into winter, and the cow hasn’t got time to recover from that on poorer feed. 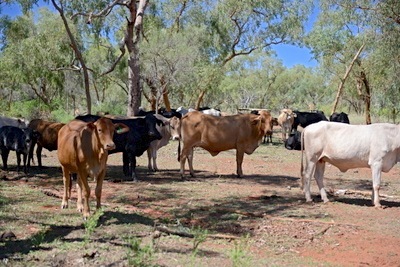 The calves are weaned into a poorer time of year, with only one wet season to gain condition before sale, so they’re well behind and we would have to supplement their feed. We keep the steers for 12–18 months based on age and weight (300–350 kilograms) then sell to feedlots or backgrounders [a cattle producer who produces young cattle ready for lot feeding]. If we can have a August–December calf, especially those earlier ones, they get 2 wet seasons to gain condition before we sell them in March/April the following year, which is a really good point. If you lived on Mitchell grass or all buffel grass, I think you’d be unlikely to realise the full advantage of rotational grazing. Because both those pastures are so forgiving, you can overgraze substantially, and with one wet season it recovers. Spinifex is quite productive in this area, but it’s very fragile and if you overstock it then 10 years later you will still see the results. Experiencing this lower carrying capacity–country that is so fragile is a benefit to my understanding of rotational grazing. Even though our clean paddocks appear okay with the heavier stocking rates in a wetter year, I think probably that the more desirable pasture may be struggling a little bit in those times. However, we’re finding that even by lifting our grazing pressure to almost double the rate, we’re still preserving those pastures. This country, good season or bad, doesn’t produce kilos on our stock. It’s just a maintenance, flat-nutrition country because our cattle don’t get particularly poor in the dry. We’re never short of pasture. It’s not fattening pasture, but it’s survival pasture. For instance, in 2005 we did extremely well. It was a dry year and we bought a large amount of fairly cheap cattle. We were able to sell their progeny and a third of the cows to pay for them in 12 months. This year  could end up providing some good opportunities with good feed and cheap cattle. These sort of things make this country more viable in these kinds of seasons. With regards to what’s next, there’s always things you’d like to spend money on. You’ve just got to really look closely whether it’s going to pay a return. 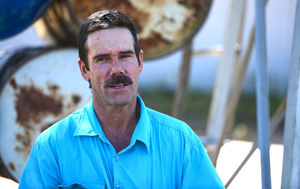 What’s in the pipeline at the moment is extending the last section of water which will water the last 20,000 acres of heart-leaf country, and have it fenced into 4000-acre paddocks. And we have some laneways planned that will make it a lot easier for cattle to move in the case of an unexpected onslaught of heart-leaf. If they have ingested the poison, the cattle won’t handle moving. The water will lift our carrying capacity, which is an immediate gain; the laneways are more for extreme times, but it’ll certainly pay for itself over time. The grazing industry has survived for a long time on standard practices, so you can’t say that those people are wrong to do so, but when something’s new and different there is quite often a bit of resistance to it. I would hope that we can encourage people to be more open-minded towards change. And change is something that’s forced upon us, whether we like it or not. If we can implement change ahead of forced change it would have to be better for industry as a whole. I am interested in the Climate Champion program because I like to see what other people are doing and hopefully I can pass that on, or try and encourage others to do what appears to be best for production and viability of the rural area. I am quite passionate about what we’re trying to do, and the innovative ways that other people are managing their climate. In all agriculture and most businesses, there are comparisons you can make to the way anyone handles adversity. We all have similar obstacles placed in front of us. With RCS in Yeppoon, my wife Donna and I did the Grazing for Profit course and went on to Grad Link and Executive Link education systems they run. The courses have been very instrumental in teaching us to manage our rotational grazing and other management practices. The 3 meetings a year for 3 years in the Executive Link program have a great cross-section of the grazing industry and a great networking experience. 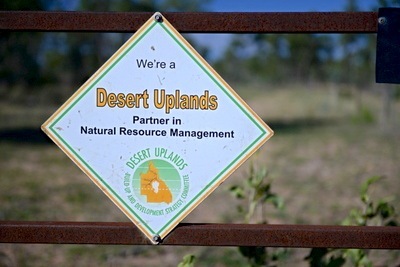 We also are part of Desert Uplands, an Aramac-based group that meets and organises field days, and Desert Channels Queensland, which is Longreach-based. 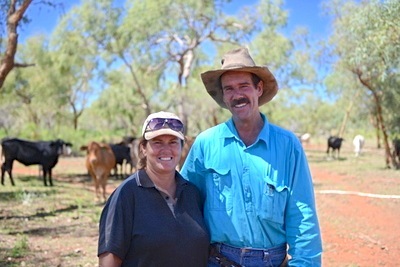 They are about productivity and helping graziers develop their land to a more productive standard. Because we’ve got that heart-leaf country up our sleeve, we’ve never really had to reduce numbers on the basis of a bad season ahead. We have had to sell cattle off this year because the agistment paddock was getting low on grass, and there was no option: forecasts are more relevant to managing that. It would certainly give us more time to be prepared. We’re probably in a very unique situation here, where climate forecasts aren’t as relevant to our decision-making. The POAMA model from the Bureau of Meteorology is something that will be really beneficial for us in Queensland. [At the WA Climate Champion program workshop] I learned a lot about how they developed it and how they’re becoming more accurate in their forecasting. I usually use the 7-day forecast from the Bureau and Elders for general management.